Dolls, what Ms. Monroe said was oh-so true, “diamonds are a girls best friend.” But for those of us who don’t have the expendable cash to reach the unreachable dream of owning such decadence they can also be a girls worst nightmare. Or so you may think. 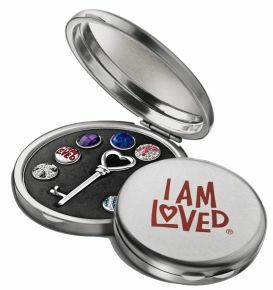 Launched just this past weekend at over 230 Helzberg Diamonds locations is…Pop Expressions! Pretty sparkling baubles with jewelry starting at le frugal-friendly $79.99, and gems hovering at the under-$50 price point. And now one (1) of you bauble-loving beauties has the chance to take a Pop Expressions piece of your very own home! Oui oui, lovers! Café Fashionista has teamed up with Helzberg Diamonds to bring one (1) lucky lady a gorgeous new addition to her arsenal of accessories via a blue frame pendant necklace that will make you shiver in your stilettos! ♥For one (1) entry, leave a comment on this post stating what form of jewelry is your favorite (necklace, earrings, rings, etc.) between now and Monday, September 19, 2011 at midnight PST. ♥For two (2) entries, Tweet about this giveaway, and leave a comment on this post stating what form of jewelry is your favorite (necklace, earrings, rings, etc.) between now and Monday, September 19, 2011 at midnight PST with your Twitter URL. ♥For three (3) entries, become a follower of Café Fashionista on Blogger/Google Reader/Google Friend Connect, or Twitter @cafefashionista, and leave a comment on this post stating what form of jewelry is your favorite (necklace, earrings, rings, etc.) between now and Monday, September 19, 2011 at midnight PST (if you are already a Café Fashionista follower, please say so in your comment). I will randomly pick one (1) name out of a hat (who knows, it could be yours! ), and announce the winner on Tuesday, September 20, 2011. Thanks to Helzberg Diamonds for the pictures. Umm may I just say that you have the best giveaways ever! I prefer earrings! I love the idea of statement rings, but I can't wear them and type.. how does anyone do it?? Tweeted about it right here! I started following you on twitter too! Oh what a cool giveaway! I love necklaces the best with earrings being second. My favorite jewelry by far is necklaces. All of my rings end up on a necklace. This giveaway is brilliant. Enjoy your holiday, E! I'm a huge fan of Cafe Fashionista and I follow you both on Google Reader and Twitter. Of course I'm a follower dear! O WoW!! so many gorgeous items to choose from! I actually really like the key necklace you are showing! Just LOVE your give aways! Following you on twitter,google and FaceBook !! What a beautiful giveaway. Oh..a necklace is most charming..especially a key like this. This would be a necklace I'd have nearby for a very very long time. This necklace never goes out of style! Necklace by far is my favorite keepsake! I love Necklaces! This is just amazing! I have to say I prefer necklaces to everything else, because they are available in much more styles than anything else. I can only wear very small earrings (hanging ones make my neck look girraffe-y) and I hate wearing rings. I'm mostly a thick bracelet gal. Thanks for hosting this giveaway! 3 entries. Old GFC follower! I am obsessed with necklaces. THey are my favorite type of jewelry. And I basically only like to wear my engagement ring and hoops or studs. Great giveaway, Erika! I think my fav kind of jewelry is probably necklaces. Such an awesome Key Necklace. I would so wear this as my favorite NECKLACE..ever.. I love rings. The can be small and subtle, or big and un-ignorable. And I'm already following Cafe Fashionista. Oh, honey, what a beautiful giveaway!!! ahhhh what a cute necklace.. i want the key one.. but i can't follow you, i dont have blogspot.. yet, i followed you via twitter.. I miss your cafe & coffee posts - past due! Rings, rings, rings. Especially the stackable styles! I would have to say rings are my favorite!! What a fantastic giveaway! I mostly wear necklaces, I have other jewelry too of course, but tend not to wear it as much, so definitely necklaces for me! I RT your tweet under WorldAroundHEr on Twitter! You always have the greatest giveaways! I love earrings to the point where I am not letting myself buy anymore for a little while. So I have recently started stocking up on rings instead! I follow you through GFC and twitter(@browniesandbows). Another great giveaway! Yahoo and thank you! I'm a follower on GFC and on Twitter. I personally love necklace, i feel so naked if I forget to put one on. My least favorite would have to be rings they make my finger swell. My favorite pieces are rings! Thanks!